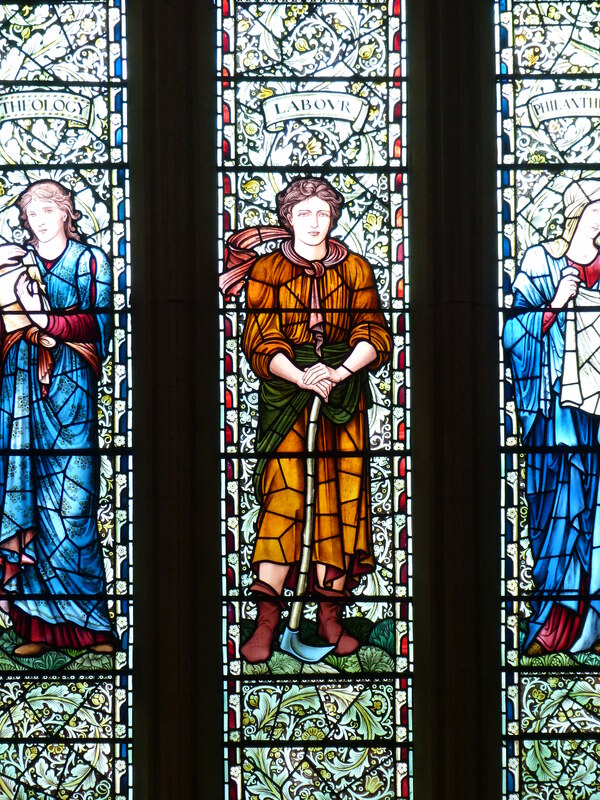 Finding three windows in the same church by the doyens of Victorian stained glass, Edward Burne-Jones, Morris & Co and Kempe & Co, is worth a celebration. When the church happens to be a pub you can celebrate without leaving the building. The Pitcher and Piano in Nottingham was once the Unitarian Chapel, in the heart of the Lace Market, the former hub of the lace trade in the city. In fact, when it was vacated as a church in 1982 it briefly became a museum to lace manufacturing before converting to a pub. 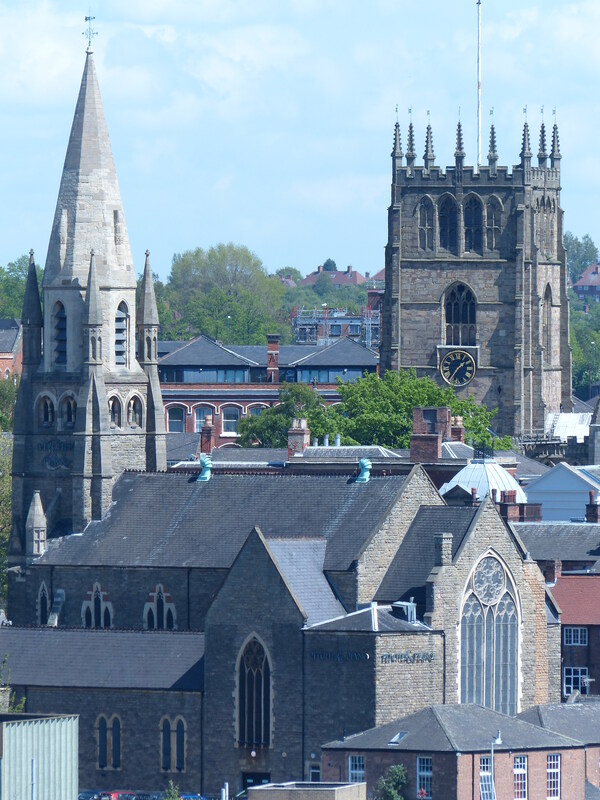 The Unitarian Chapel and St Mary’s parish church, both in Nottingham’s Lace Market area. Taken from Nottingham Castle. The pub is full of glorious stained glass. 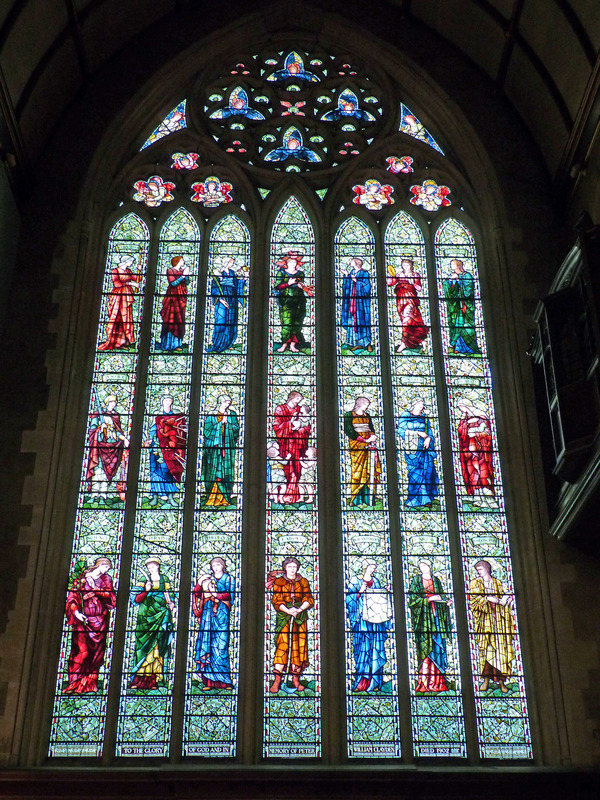 The three windows I want to highlight are all memorials to prominent members of the congregation. The east window is the gem. 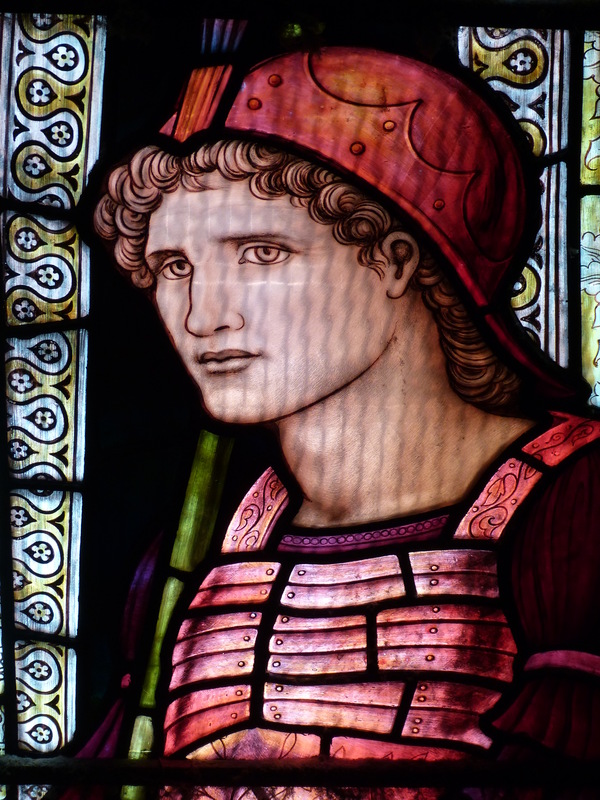 It was designed by Edward Burne Jones, except for one panel, which was the work of Henry Dearle, who replaced Burne-Jones as Morris & Co’s chief designer after his death in 1898. It is dedicated to Peter William Clayden, who was the minister from 1860 to 1868. 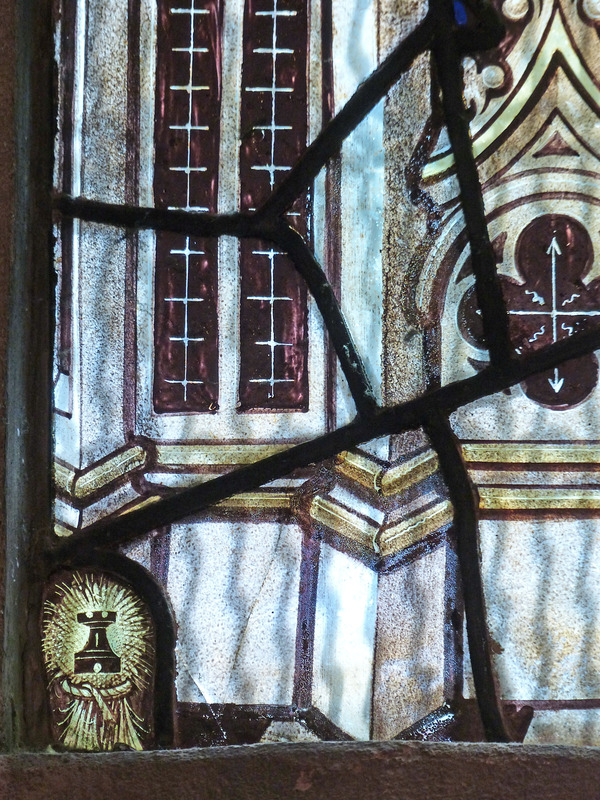 The Unitarian Chapel was a wealthy church, as the quality of the stained glass suggests. It was built in 1876 but its origins go back to the “Great Expulsion” following the Act of Uniformity of 1662, which created Non-conformism in England. In 1665 dissenting clergy were not allowed to preach within 5 miles of Nottingham, a ban which lasted until the Act of Toleration in 1689. The first chapel was built shortly afterwards. It became known as “Unitarian” after the Doctrine of the Trinity Act of 1813. This amended the Blasphemy Act 1697 by tolerating non-conformist clergy who denied the orthodox belief that there were “3 persons in one God”. By the end of the 19th Century, many of Nottingham’s industrialists, especially lace manufacturers, were part of the Unitarian congregation. Peter William Clayden (1827-1902), in addition to being the minister for 8 years, was a journalist, prominent Liberal, supporter of Gladstone and strongly against slavery. He worked on the Boston Guardian for a while and supported the cause of the North in the American Civil War. After leaving Nottingham he moved to London and worked for the Daily News, the newspaper started in 1846 by Charles Dickens. He became leader writer and night editor. 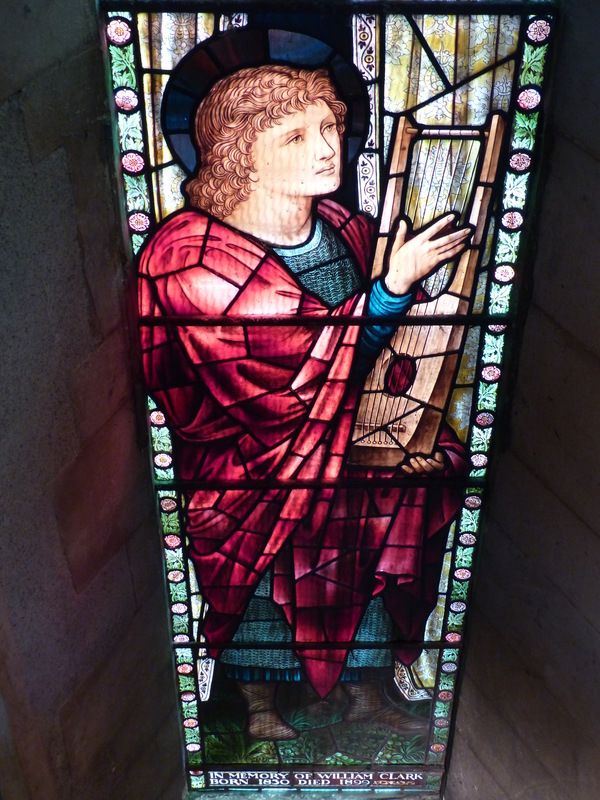 The window to his memory is deeply symbolic, representing the virtues and religious aspirations of Christianity, together with the forms of knowledge and activity relevant to these attributes, hence Science, Literature, Theology, Philanthropy, Art Philosophy and Labour. The other two windows are equally exquisite. 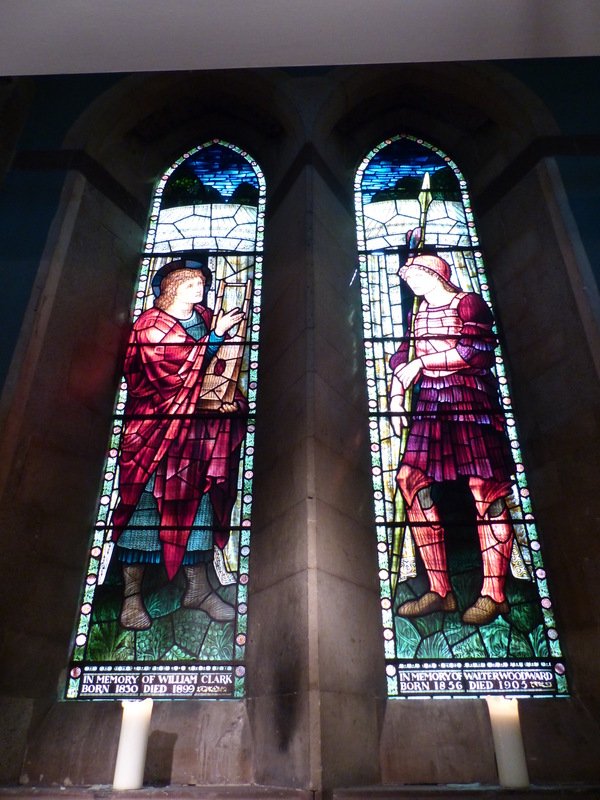 This is the other Morris & Co window, of 1907, commemorating the friendship of William Clark and Walter Woodward, two members of the congregation who were promoters of the chapel. This explains the biblical theme of David and Jonathan. This commemorates Roby Myddleton Gotch and Philip Joseph Crook, cousins who were killed in the First World War. 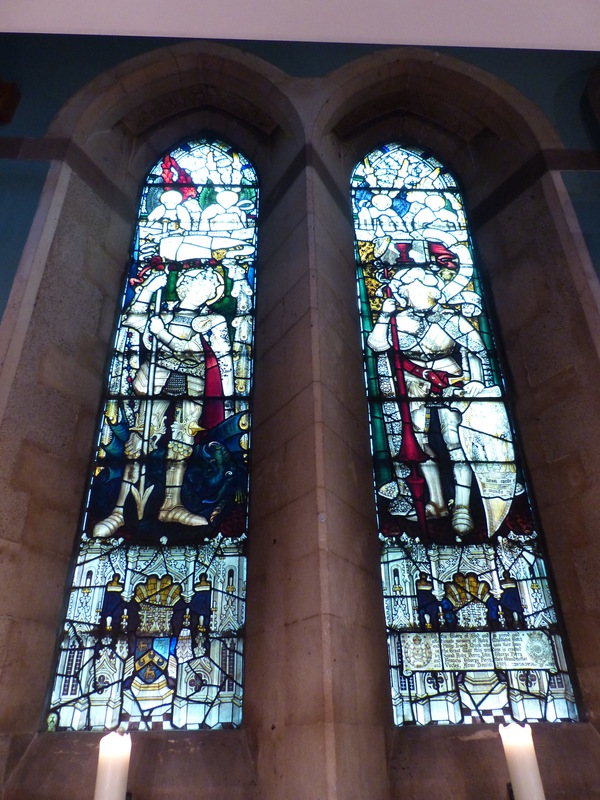 The subjects, designed by Kempe & Co, are St. George and Sir Galahad, symbolising the fight against evil and the bravery of the two soldiers, who were in the 7th Battalion Sherwood Foresters (the Robin Hoods) and the Duke of Lancaster’s Own Regiment. 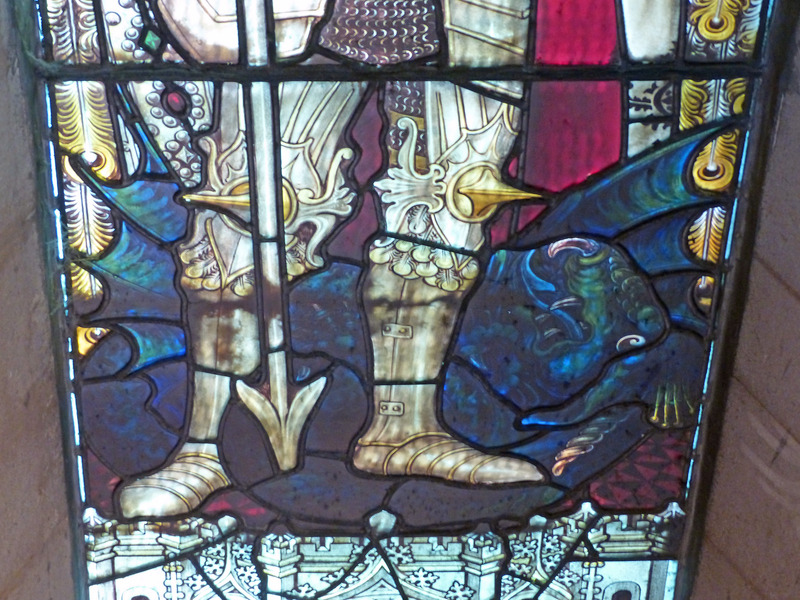 The light is difficult on this photo but enlarging the smaller enhanced photos below reveals all the colour and intricate detail of Kempe and Co’s work. 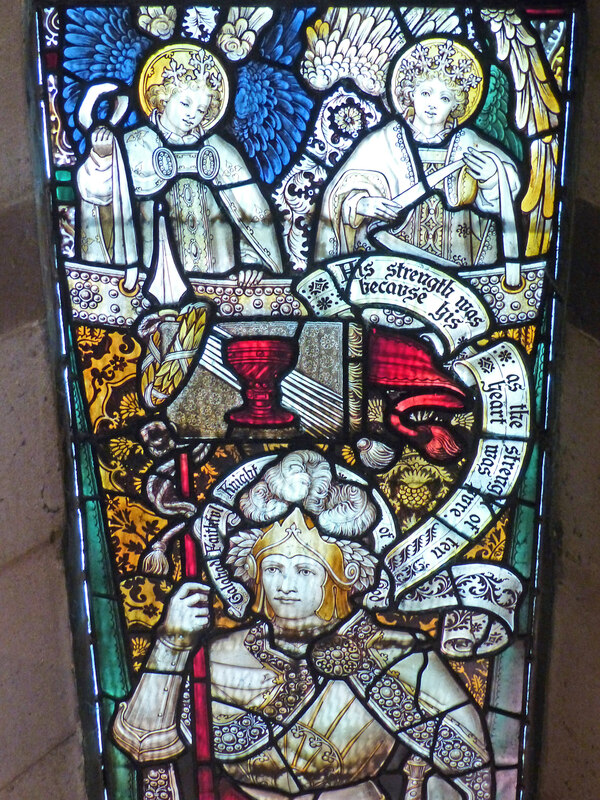 It is interesting to note that both the Unitarian Chapel and St Mary’s parish church, a few metres along the same road, possess St George windows by Kempe & Co (see post of 17 March). Could it be that the two churches vied for prestige and the memory of the expulsion of two ministers from St Mary’s in 1662 never died? Kempe & Co trademark of wheat sheaf and tower. Music for Everyone (est. 1983) is committed to making a difference to people’s lives through the creativity and enjoyment of music. We support people to discover and develop their musical interest, abilities and aspirations at all levels. Music for Everyone is an open, welcoming and collaborative organisation. We build a sense of community and belonging through the high quality musical experiences we provide for participants, audiences and our staff. We aspire to enhance the inclusivity of our programme by building partnerships with likeminded organisations, so we can reach more people through our work. Brief Descriptions of my Adventures, at Home and Abroad.